Internet is for forever and so is your reputation. Let us build a memorable brand reputation together. Whether you’re stuck with negative search results, or you're defending your brand repo or you’re looking for any other service. We build professionally optimized profile for your brand to dominate the leading pages of Google, Bing, Yahoo and other search engines. Our experienced, creative writers produce impeccable blogs, news, articles and enhance your visibility over search engines and social media. We shake hand with you to implement highly effective processes for acquiring positive customer reviews on different spots such as Google Places, Yellow Pages, Yelp and other review sites. We have in-house experienced team of public relations professionals, who writes search engine optimized press releases to market your business online. Our digital experts actively monitor the web as well as online conversations for your business and assist in drafting response(s), if required. We report through comprehensive monthly report enclosing executive summary and performance metrics that assist you in tracking the growth of your online reputation management campaign. 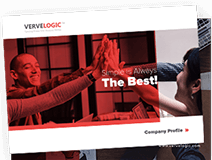 VerveLogic is an online reputation management company serving small and mid-sized businesses with a complete range of Brand Management and Internet Marketing Services. Our online reputation strategists invent and execute programs that improve search engine results for individuals as well as for brands. Amazing and dedicated professionals on work. These guys are in forefront to put best of ideas in the industry to make business grow. Well done! My business was not working well until I seek help from them. They have given me a great result! Thank You! They have bunch of experience professionals. I got all what i expected. Hats off! These guys have a very fresh perspective towards any kind of problem they encounter. I am really satisfied.